The awakening of the soul. Unbelievers who have not found God and live without seeking him are crazy and miserable. To pray and live the Christian life, the spirit and practice of penance are essential: there is genuine Christian who can help it. Penance begins with consciousness of sin, repentance development, inspired the order in the choices of life, it is expressed in the confession and in the restoration of the distorted personality and subverted charity from sin. It is completed in Sacrament of reconciliation, with God and with the community of men. It continues with a renewed, atention and continued vigilance on faith, hope and charity, justice, fortitude against temptation, to lay the tendencies and instincts to goodness service. Penance, however, in the mentality and in the current culture is not nearly citizenship. Even the movement and the prayer groups seem to ignore. Missing meditation on the life of Jesus, on his victory accomplished with his mercy toward sinners and the voluntary passion. The same Sacramental confession is deserted, or at least is not accompanied and followed by the consciousness and the daily practice of penance. 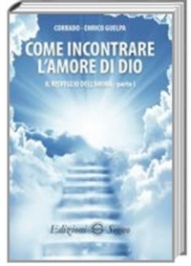 "How to meet the love of God. The soul awakening" it suggests many themes that have to do with the Christian penance. It presents the richness and multiplicity connection with spirituality and the moral life. It helps to bridge the gap that unfortunately has spread about the reconciliation and of the virtue of penance. It is crucial for life to know whether the soul is mortal or immortal, if there is an afterlife after death, if there is a God who welcomes us and judges us. We must renew oil relationship with the Almighty and with others, to regenerate that energy able to shake the conscience, wake enthusiasm and love. In short, we must re-establish the dialogue of the soul with God. Every heart feels the need of beauty and the sublime, because he has the memory of the lost Paradise, guarded deep in the soul. Every man would like to tear a strip of heaven and live on this earth in the heart with happiness that there reigns. In reading this book my soul is illuminated of God, the heart has turned to his flame, spiritual reading, prayer, meditation, introduced me to the light.